"We're not endorsing McDonald's or Ronald McDonald, but wanted to make sure the message was safe and appropriate," said Reginald L. Washington, co-chairman of the academy's task force on obesity. The program, he said, "takes advantage of the fact that Ronald McDonald has such recognition with kids that if he tells them to get moving, maybe they will do it." Can't fool me. Ronald is a hard working clown. Even if he is talking about hamburgers 90 percent of the time, and about nutrition 10 percent of the time, he is making the sale as best he can 100 percent of the time. I wouldn't want him near my kids without me there to listen in. Here is the website for the Institute of Medicine's recent workshop on marketing to children. The anti-marketing presentations show the industry's power of persuasion, and the pro-marketing presentations demonstrate the industry's muscle. Some presentations are on the site already, and more should be posted shortly. ''Their regulation is working against the public interest,'' fumed Joe Procacci, the 78-year-old chief executive and co-founder of the Philadelphia-based company, adding that he's got the demand to prove it. (1) When containers are marked in accordance with Table I, the markings on at least 85 percent of the containers in a lot must be legible. (2) In determining compliance with the size designations, the measurement for minimum diameter shall be the largest diameter of the tomato measured at right angles to a line from the stem end to the blossom end. The measurement for maximum diameter shall be the smallest dimension of the tomato determined by passing the tomato through a round opening in any position. (b) In lieu of marking containers in accordance with (a) above or specifying size in accordance with the dimensions defined in Table I, for Cerasiforme type tomatoes commonly referred to as cherry tomatoes and Pyriforme type tomatoes commonly referred to as pear shaped tomatoes, and other similar types, size may be specified in terms of minimum diameter or minimum and maximum diameter expressed in whole inches, and not less than thirty-second inch fractions thereof, or millimeters in accordance with the facts. But I shouldn't make fun. You can imagine the authors of the preceding passage do not think ugly tomatoes are a joking matter. The 51st Annual Conference celebrates the power of discovery and education. Consumer professionals from all over the world will gather to experience the most exciting networking event of the year and share the latest consumer policy research and education. This year’s conference will be at the Hyatt Regency Columbus Hotel in Columbus, Ohio. Speakers include President of Investor Protection Trust, Don Blandin; Dr. Connie Weaver, Distinguished Professor and Department Head at Purdue University’s Foods and Nutrition Department; and Linda Golodner, President of National Consumers League. You will not want to miss the opportunity to hear the expert speakers and the paper presenters. Join us, as we discover the latest in research and re-connect with our peers in Columbus, Ohio, April 6-9, 2005 for the 51st Annual Conference of the American Council on Consumer Interests (ACCI)! The latest edition of the Dietary Guidelines, released earlier this month, give advice that's more at odds than ever with the typical American diet -- nine servings of produce instead of five, more dairy, more whole grains, and less of the sugary and other "empty" calories that make up much of people's meal plans. He quotes Alice Lichtenstein, from the faculty of the Friedman School of Nutrition Science and Policy at Tufts, emphasizing the hazards of eating out. But she also puts the whole thing in perspective. "The guidelines 'are goals,' she said. 'They're something to work toward over a lifetime.'" See also a companion article by Judy Foreman arguing that one hour of exercise is easier than you think. The current emphasis on increasing physical activity in young children has arisen in response to the childhood obesity epidemic. The authors suggest that efforts to increase physical activity in young children might be more successful if we emphasize other outcomes, besides obesity, and use different language. Specifically, they suggest using the word “play” rather than “physical activity” or “exercise,” and emphasizing the benefits of play for children’s social, emotional, and cognitive development. Play is about more than improving fitness and reducing fatness. The same thing could be said about children and eating. Food, too, is about more than improving fitness and reducing fatness. In this NBER working paper abstract, Richard Stessel of the Ohio State University uses data from 28,000 slave manifests housed at the National Archives to measure how weather and slaveowner decisions about nutrition inputs affected slave heights. The start of the title is: "Fluctuations in a Dreadful Childhood." The much anticipated Institute of Medicine (IOM) workshop on food and beverage marketing to children will take place this coming Thursday, January 27. The National Academies will provide an online simulcast for those who are unable to attend. It should be lively. The agenda includes industry perspectives from Pepsico, Kraft, McDonald's, and General Mills; marketing perspectives from Nickelodeon and advertising companies; and research perspectives including Victoria Rideout from the Kaiser Family Foundation. Her Senate testimony last March eloquently surveyed the evidence linking children's media consumption with risk of obesity. The IOM workshop and future report were discussed by senator Tom Harkin (D-IA) at the Food Research and Action Center's recent Local School Wellness Policies Briefing. The Child Nutrition bill last year included a provision requiring schools that participate in federal food programs to establish school wellness policies, including guidelines for the sale of all foods on campus. When I first heard of this provision, I thought of it as fairly weak, but a close reading of Harkin's comments actually makes the provision sound quite astute. Perhaps it is not necessary for the federal government to mandate the policy particulars for the nation's diverse school districts. All that is needed is to put the school policies on the public record. Then, in those regions of the country where parents cherish their children and children obey the laws of physiology -- whichever regions those should be -- it should be possible to make progress toward protecting children from junk food and marketing at school. A sense of humor at the Federal Trade Commission? See their website promoting a miracle eggplant extract that will let you "feast on your favorite foods.... and lose up to two pounds a day!" This site is the lead feature on the federal government's gateway site for nutrition information. As a follow-up to the previous post, it is worthwhile to quote the healthy skepticism that the FTC and Food and Drug Administration have toward weight-loss claims other than those represented by the Dietary Guidelines. Would these federal agencies approve of licensing high-fat dairy products with weight loss claims? Consult with your doctor, a dietician, or other qualified health professional to determine your ideal healthy body weight. Eat smaller portions and choose from a variety of foods. Load up on foods naturally high in fiber: Fruits, vegetables, legumes, and whole grains. Limit portions of foods high in fat: dairy products like cheese, butter, and whole milk; red meat; cakes and pastries. You have probably seen the advertisements claiming that dairy products promote weight loss. The claim might or might not be true. In the journal Obesity Research last year, a study of 32 individuals on calorie-restricted diets reported that those who consumed more dairy products showed greater weight loss. The latest issue of the Nutrition Action Healthletter cites a larger study in which a high-dairy diet didn't help people lose weight (sorry, the article isn't online). I am not a nutritionist, so I generally rely on the Dietary Guidelines for the mainstream consensus view on these nutrition issues. The expert panel for the guidelines considered the evidence for such claims, and the Guidelines recommend lowfat dairy products for many reasons, but they do not corroborate the dairy weight-loss claim. The dairy weight-loss claim is also not on FDA's list of health claims that meet the standard of "significant scientific agreement." You may be interested in some of the "nutrition economics" related to this claim. The lead author of the Obesity Research article is Michael Zemel, whose employer, the University of Tennessee, holds a patent on the claim that dairy consumption improves weight loss. Zemel is listed as "inventor" for the patent (enter patent number 6,384,087 in this link). The university has an agreement to license dairy weight-loss claims to private companies, and the enforcers of this agreement threaten lawsuits against those who make such claims without a license: "Companies that make claims but do not have a license could face legal action." Fear not, however. If you do purchase licensing rights, you will be permitted to make such claims regardless of whether your dairy products are low in fat! As an example of dairy industry interest, see Mayfield Dairy's promotion of dairy-based weight loss in collaboration with Tennessee on the Move, an affiliate of the national America on the Move, which promotes healthy living and counting "steps" using pedometers. The Tennessee on the Move affiliate strongly promotes dairy consumption as a weight-reduction tool. The nonprofit organization's executive director? Michael Zemel. Questions: Is this USDA-sponsored promotion subject to a licensing agreement with University of Tennessee? Is it consistent with the Dietary Guidelines? Is the public interest or private interest being served here? Morning Edition, January 21, 2005 · In Miami, there's a growing trend among supermarket chains to carry a wider variety of ethnic specialty foods. It's an effort to compete with small neighborhood shops and warehouse stores. The Publix chain, which has stores in southeastern state is adding several Latino items to its brand line. Stressing weight loss also avoids the much harder job of telling Americans the truth about specifically what not to eat. The government's recommendations only tell part of the story; the politically expedient part. I am a regular reader of Simon's monthly publication, Informed Eating. The Half Changed World weblogger, a mother and self-described policy wonk, has been attempting to feed her family on the Food Stamp Program's monthly budget, which is based on the Thrifty Food Plan. Here is her original post, and most-recent update half-way through the month. Her experience is much like my family's when we tried this last year. My family just missed being able to meet the budget if you count restaurant food I bought at lunch when I had to eat out for work. Our grocery store bill came in around $50 under the monthly limit. Our conclusions were: 1) it is possible to eat healthy palatable meals on that budget, but 2) it takes time, concentration, and a high degree of price awareness to do so. Incidentally, the Half Changed World author is trying for $434.40, while this year's maximum food stamp benefit for a family of four is $499, according to USDA's Food and Nutrition Service. An important policy question is whether this is the right amount. Some things to think about: working families sometimes must eat food from restaurants or cafeterias, which cannot be purchased with food stamps; many families get food support from several sources, including food stamps, school food programs, WIC, and food banks and food pantries; the food stamp benefit is not scaled according to the age of children, only according to family size, so the food stamp benefit computation treats a teenager the same as an infant who gets infant formula from WIC. Half Changed World's exercise was prompted by this wide-ranging debate at Asymmetrical Information, which was in turn based on this article by Leslie Gevirtz at Reuters. Gevirtz had interviewed me about USDA's food security measurement methods, which are currently under review by an expert panel at the National Academies. The weblogger's reporting about her family's experience on this budget has generated interesting follow-up commentary by other online writers. A charismatic leader who said he ate a McDonald's product most days, Bell was diagnosed with colorectal cancer just weeks after being named to the company's top job in April.... The company's first non-American CEO, Bell had succeeded Jim Cantalupo, who died suddenly of a heart attack after a little more than a year on the job at age 60. Bell had begun working for McDonald's at age 15 in Australia. He had worked closely with Cantalupo, also a 30-year McDonald's veteran, to turn the company's fortunes around in recent years. The executives had introduced innovations such as meal-sized salads. Bell is survived by his wife and daughter. "McDonald's paid about $300,000 to fly Bell and his family back to Australia in a special medically equipped aircraft," according to CNN/Money. Compounding the tragedy for McDonald's, Bell's death makes an uncomfortable juxtaposition with heavy news coverage several days earlier of a new study in the Journal of the American Medical Association, linking colon cancer with meat consumption. The American Cancer Society reported, "People who eat a lot of red meat or processed meats may be raising their risk for colon cancer." According to co-author Michael Thun,"While these risks to overall health are not in the same league as the risk from smoking, obesity, and physical inactivity, these findings are important because red and processed meat are major components of the diet of many Americans." Does USDA praise brownies and disparage carrots? I wonder if USDA's attorneys feel any embarrassment claiming this advertisement as government speech. But, to be fair, while most of the $40-$50 million Beef Board budget goes to promotions, some if it goes to product improvement. Like this gem from the product development labs in 2003 -- Cheeseburger Fries. It’s a match made in heaven – America’s favorite sandwich in a fun new French fry shape. Last year restaurants served up more than 8 billion hamburgers, making them the most popular sandwich in America. Recognizing this love of hamburgers and an opportunity to introduce new beef appetizers to the menu, the R & D Ranch® created Cheeseburger Fries®. A tasty combination of ground beef, cheese and breading. If the following press report is correct, Cheeseburger Fries have 48% of calories from fat, or almost 90% of calories from fat for the product sold to school children. I would guess somebody made a typo, but you still get the right impression. Like most bar snacks, cheeseburger fries pack quite a dietary wallop. Each individual fry has about 75 calories and 4 grams of fat. The fries for schools have less beef per serving but still have about 60 calories and, in fact, more fat - a total of 6 grams - in each fry. And nobody eats just one. The 2005 Dietary Guidelines became untenable the instant they abandoned the long-term pledge to promote better health for all Americans and instead made everything about weight..... What happened to common sense? There's nothing "sensible" about these guidelines. They're not just advising "eat a healthful variety of foods, enjoy everything in moderation and get some activity each day that you enjoy." It's a DIET -- and an extreme one at that -- masquerading as "healthy eating." And this link to the Food Pentagram. From USDA/ERS: "This year's conference will be held February 16 and 17 at the Economic Research Service, 1800 M St, NW, Washington, DC. Session topics will include the Food Stamp Program, WIC, and child nutrition. The conference is free and open to the public, but registration is required. A preliminary agenda is available." This illustration is from the Washington Post's coverage of federal dietary guidance. For the majority of Americans the simple facts are these: We should be consuming fewer calories; eating more fruits, vegetables and whole grains; eating less meat and dairy; and cutting back on sugar, fat and foods high in simple carbohydrates. And getting more exercise. 8. The dietary supplement industry: "While recognizing the sound basis of the guidelines, the National Nutritional Foods Association (NNFA) expressed concern that nutritional supplements do not feature prominently enough." The Guidelines consensus view is that variety of real foods suffices to provide the nutrients we need. 9. The extreme right: "When the federal government released its updated dietary guidelines yesterday, the ever-growing cabal of food activists -- quite predictably -- tried to turn them into a launching pad for dietary dictates." Untrue and humorless. 1. The organic folks: "Helping our children learn about where their food comes from and how it is grown is an important tool that every health-conscious parent can give their child." The Guidelines serve health-conscious conventional eaters quite well, but don't include many treats for the strict vegetarian or organic communities in particular. 2. The beef industry: "Along with colorful fruits and vegetables, non-fat and lowfat dairy products, and whole grains, beef is a premier naturally nutrient-rich food. 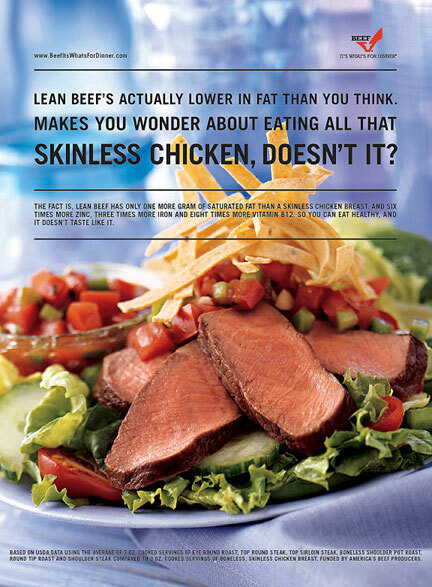 Calorie-for-calorie, lean beef provides more nutrients in fewer calories than many other animal proteins." Read that last sentence carefully. It's pretty faint praise. Makes me want plant food. 3. The Center for Science in the Public Interest: "The new Dietary Guidelines is the most health-oriented ever." I thought they would approve. 4. Sanfaustino: "However, the section on calcium food choices missed a very important development in the food channel...." Haven't heard of Sanfaustino? Wondering what their gripe is? They make a bottled water supplemented with calcium. 5. The rice industry: "Enriched and whole grain products, like enriched white rice and whole grain brown rice, are among the food groups that should form the basis for a healthy diet, according to the 2005 Dietary Guidelines for Americans." There's a bit of me-tooism here. White rice is the industry's big seller, but whole grains were recommended in the guidelines. The rice industry opposed the new emphasis on whole grains. The headline on PR Newswire was, "Grains of Truth Show Rice Fits New Dietary Guidelines Recommendations." 6. The fish industry: "Today's announcement reinforces what many of us grew up hearing from our parents -- eat more fish." Delighted, just delighted. This industry benefits from new science that gives less emphasis to total fats and more strongly criticizes saturated fats and trans fats. Some kinds of fish are high in healthier omega-3 fatty acids. 7. The sugar industry (via Washington Post): "We stand firm in our assertion that every major scientific review, including the Institute of Medicine macronutrient report, has concluded that there is not a direct link between added sugars intake and any lifestyle disease, including obesity." This claim misleading. By "not a direct link," the industry means that they think the calories in sugar, as opposed to some sugar-specific phenomenon, are the main reason sugar intake is so strongly associated with obesity. That weak claim is disputed, and even if it were true, it would be quibbling with the Guidelines' sound advice. The sugar industry is the biggest loser this week. Marian Burros of the New York Times has nice coverage of food marketing to children. Plus, Ted Wilde (no relation, er... well okay my dad) sent me the Christian Century for Jan. 11, which has a nice review of three books on children and consumerism, including Consuming Kids by Susan Linn. I can't find the review online, but here is the magazine's website. Speaking of dads, the same issue has a thoughtful review of a recent sociology treatise about religion and progressive fathering. What strange planet have I landed on? One month into weblogging, I must say I had NO idea what I was missing. First, you can see from these posts about the Monster Thickburger (1,2) that some other webloggers on the food beat are more fun to read (note to self: can you LOSE the self-righteous sincerity?). Do read them. Second, I won't try to keep up with all the food weblogs listed on Kiplog's Foodblog (1,2,3). But I do promise to add a blogroll to the right-hand column as soon as time permits. Third, forgive the delay while I slowly catch up with basic features like trackback. Perhaps after the Spring semester. 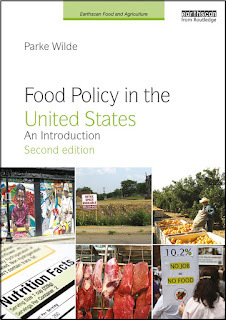 As a low-tech solution, here are some weblogs that have commented on articles in U.S. Food Policy (1,2,3), plus I almost don't want to mention this fascinating weblog about eating well called A Full Belly, which essentially called me a nerd. The 2005 Dietary Guidelines for Americans were released a few minutes ago. I will follow the ensuing discussion in this space in the coming weeks, but for now a brief comment: the Guidelines are good enough. The first "key recommendation" paints a reasonable picture of a healthy diet: "Consume a variety of nutrient-dense foods and beverages within and among the basic food groups while choosing foods that limit the intake of saturated and trans fats, cholesterol, added sugars, salt, and alcohol." What does this recommendation mean in practice? The federal government advises Americans to eat fewer hamburgers, fewer Doritos, less ice cream, and less pizza, but prefers to name the nutrients contained therein rather than name the foods by brand name. So be it. There had been some talk that the Guidelines might chicken out about criticizing added sugars, but they held firm. Later "key recommendations" encourage consumption of certain foods, including fruits, vegetables, whole grains, and nonfat dairy products. It is politically easier to encourage eating more of something, and harder to encourage eating less of its competitors. Still, considering that the Guidelines explicitly advise reducing calorie intake overall, any thinking reader can get the picture. The Guidelines promote many foods, but never meat, eggs, most kinds of cheese, or sugary drinks. For government work, the Guidelines are plenty clear. As a matter of strategy, I encourage those who think about the food economy from a public interest perspective to praise the Guidelines and then hold the powers that promote them to account. For example, now that the federal government claims all of the commodity promotion board messages as "government speech," somebody should ensure that the advertising adheres to the new Guidelines. As another example, the Grocery Manufacturers of America, immediately announced they will support the Guidelines. Great. See that they do. Howard Witt and Andrew Martin wrote a piece in Saturday's Chicago Tribune in which they discussed federal farm disaster payments. This is a topic that has received a fair amount of attention recently. Back on November 14th the Des Moines Register published a news article on this topic entitled, "In some states, disaster payments have become cash crop for farmers." And, on December 20th, the editorial board at the Wisconsin State Journal (Madison, Wisc.) published an opinion piece arguing for disaster assistance reform in a piece entitled, "Rein In Growth In Farm Disaster Aid." The January issue of Informed Eating links to an update on California's school food bill, which failed last year and is being introduced again. If it passes, it would place nutrition standards on "competitive foods" in grades K-12. The online newsletter also has an editorial on the similarities between Coke and Big Tobacco, a second look at the "Fat Tax," and a link to Cornell nutritional biochemist T. Colin Campbell's book-length argument for plant-based diets, The China Study. The Marginal Revolution has some interesting thoughts, somewhat tongue in cheek, about diets. But actually my colleagues in nutrition circles also have mentioned this idea that the novelty and strangeness of diets is what leads to the calorie reduction. A related study from Tufts-New England Medical Center has been getting a lot of media attention recently. Suppose you are a reasonable parent. You are worried about the psychic grip food marketers have on your children. But you have some faith in private markets and are slow to turn to the government for policing. You wish somebody outside the food industry would think through the complex nutritional considerations and propose tough yet feasible guidelines. Still, you would like to give moral suasion and voluntary industry restraint a chance to work before, at some later date, you may reluctantly grow sympathetic to calls for stricter regulation. Is there anybody in the public interest advocacy community reasonable enough to fit your needs? Sure. See the approach to children's food marketing announced this week by the Center for Science in the Public Interest. So, to recap: Berman the Defender of Consumers runs a nonprofit that collects donations from industries served by Berman the Corporate Lobbyist -- and also pays lucrative fees to Berman the Corporate Lobbyist for his services. If you managed to follow that, you'll probably agree that Berman has pulled off a pretty impressive piece of lobbying jujitsu -- one that says an awful lot about how things really function at the nexus of government policy, big corporations, and the media. Other good sources cited in the American Prospect article include PR Watch, which has posted a list of the Center for Consumer Freedom's financial backers, and the Citizens for Responsibility and Ethics in Washington (CREW), which is pursuing legal action against the Center and has posted relevant documents online. This paper finds that weight lowers wages for white females; OLS [regression] estimates indicate that a difference in weight of two standard deviations (roughly 65 pounds) is associated with a difference in wages of 9 percent. In absolute value, this is equivalent to the wage effect of roughly one and a half years of education or three years of work experience. p.s. Bruce is right that correlation does not prove causation. The Marginal Revolution economics weblog today linked to a clever graphic on federal discretionary expenditures. Here's a challenge: try to find the USDA's Food and Nutrition Service, which funds food assistance programs. But a warning to the reader -- the graphic overstates its case unnecessarily by focusing only on the discretionary budget. Its point would have been still true, and only somewhat less dramatic, using all federal expenditures. Can THIS really be government speech? Hooray. The Supreme Court transcript I was waiting for came out today. It is a wonderful lively argument. As press reports had indicated, Justice Ruth Bader Ginsburg was in good form. JUSTICE GINSBURG: What is the government speech? Usually, the government has a position, and is presenting it. Here, we have America beef producers has a label on -- "Eat meat." But if you went to the Surgeon General, probably that message would be "Eat meat moderately." So what is the government speech? I don't know another case involving a claim of government speech where the message that you are saying is the government's is not the message that the government is putting out when it's dealing with its concern for public health. MR. KNEEDLER[for the federal government]: Well, the government, in the concern -- in situations where it may be concerned about public health, doesn't say, "Don't eat meat." It -- there may be nutritional standards. And USDA does have nutritional standards that it advises people to adhere to. But what the government is doing here is facilitating a situation, facilitating promotion of a commodity. It was nice of Mr. Kneedler to concede that "there may be nutritional standards." It is certainly true that in recent decades, the federal government has taken care to avoid the words, "Don't eat meat." The Dietary Guidelines for Americans essentially imply "eat less meat," but official pronouncements generally require more than three words to make the issue sufficiently muddy to avoid a fight. In the current expert panel report proposing new guidelines, you can find the true nuggets of public health wisdom (no sarcasm) buried deep under the mild heading, "Choose fats wisely for good health." But, weary from years of following this argument, I despair of waiting for the public to demand consistency from the federal government on nutritional grounds. The public interest speaks too often in whispers and squeaks. I am now placing my hopes on a new white knight. There are some billionaires with muscle in the poultry industry, aren't there? Somebody tell them that the following ad has been claimed by the government as "government speech." Perhaps they will put a stop to this nonsense (either that, or ask for a commodity promotion program for themselves). p.s. I don't imagine anybody in the industry minds me reproducing this ad. If it is government speech, it is in the public domain. How can you tell when a government report found something interesting? When the caveat in the executive summary is shouted in loud italics: "It should be noted that this research was not designed to assess program impacts or in any way attribute differences observed between FSP participants and either group of nonparticipants to an effect of the program." This line certainly made me want to read the latest report on food stamps and nutrition, released last week by USDA's Economic Research Service. But now consider the women's self-perception of their weight. Food stamp participants are less likely to perceive themselves as overweight. The report's authors are surely right to avoid jumping to conclusions from one study, but at the very least this pattern raises the rank of comparatively burdensome policy options: heavier emphasis on nutrition education, for example, or targeted "green stamps" for fruits and vegetables, at least as part of the benefit package. In any case, there has already been more than one such study. Economist Diane Gibson published an interesting article about the positive association between food stamp participation and risk of obesity a couple years ago. It seems to be available free online from the Journal of Nutrition(but please let me know if the link fails to work). Overall, the association between food stamps and obesity has been found in diverse data sources. The question is why? This is a question I will follow as this weblog develops. NYT Magazine -- "Heavy Questions"
Yesterday's New York Times Magazine article on obesity in the border counties of Texas was widely circulated on the internet today. My family frequently swims and walks at Walden Pond, a few miles from our home. Even on a sunny New Year's Day, falling in winter this year as it usually does, we mainly had walking in mind, although we did see one brave family take a ritual dip as they apparently do every year. Actually, the children in the family bravely hid their embarrassment on shore while their parents braved the waters. The pond is popular with free-spirited folk. My oldest child, four years old, likes the replica of Henry Thoreau’s tiny cabin next to the parking lot and also the quiet grove where the original cabin’s foundation lies at the far shore of the pond. The boy knows Henry as the bear in the delightful books by D. B. Johnson, who captures for children the heart and soul of Thoreau’s essays. To our delight, yesterday, the cabin was occupied by a charming and talented Thoreau re-enactor who invited us in for traditional local New Year’s Day biscuits (baked in a real wood oven from a nineteenth-century recipe). I meant to tell him how good he was at his acting, but part of his charm was his refusal to break character, so I thought better to leave the compliment unsaid. Once my eldest got over his surprise in finding that Henry was a person rather than a bear, he was enchanted. He especially liked hearing about the Concord jail, from which Henry said he had recently been freed. Today, a day later, my son asked me if I paid taxes. It is a good day to reflect on the real necessaries of life. Happy New Year.